A hand-sewn, shaped, and assembled dark horsehair broom with a waxed and dyed beech stock, and detachable softwood handle. The moderately soft fine bristles are ideally suited to the sweeping of most internal floors, collecting dust and fine particles more effectively than stiffer synthetic or vegetable fibres. Made by hand in a small family run workshop in the town of Versmold, Germany. With a 28cm stock. 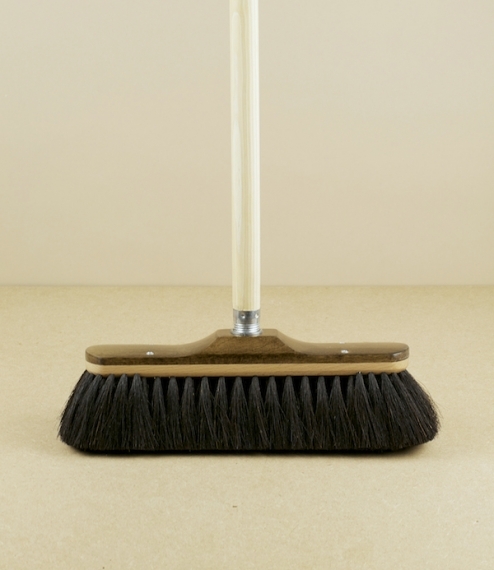 Supplied without a handle but with an adaptor for attachment to standard (approximately 23mm) wooden broom handles.